What’s that weird-looking object pictured above? Is it a rudimentary pair of scissors? Chop sticks? Some kind of hair clip? Nope, it’s a glove stretcher. A glove stretcher was a must have for any nineteenth century lady. During the period, kid leather gloves became very popular, despite the fact they weren’t easy to put on. They were very snug, especially after they were washed. So, after every wash, a glove stretcher, which was shaped more or less like a pair of scissors and tapered to a point to recreate the form of fingers, were used to enlarge the fingers of the gloves. How did they work? Well, you simply had to squeeze the handles together, and voilà. You were then able to put the gloves on easily. Glove stretchers were about 8 inches long and usually made of bone, wood or ivory, with a spring hinge made of metal. Some were plain, like the one shown above, while others, usually pricer and reserved for a richer clientèle, were elaborately carved and decorated. 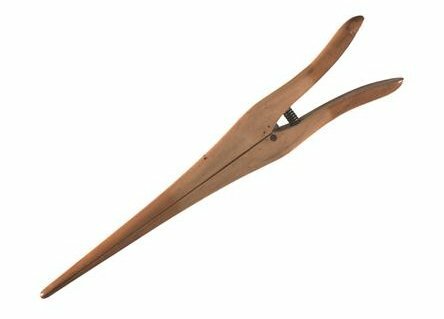 Glove stretchers remained popular until the beginning of the twentieth century, when more and more women stopped wearing gloves, thus making this once so handy tool unnecessary. Had you ever seen a glove stretcher before? And do you know of any other object that was once very common but has now been forgotten?